We export High Temperature cables to Afghanistan, Albania, Algeria, American Samoa, Andorra, Angola, Anguilla, Argentina, Armenia, Aruba, Australia, Austria, Azerbaijan, Bahamas, Bahrain, Bangladesh, Barbados, Belarus, Belgium, Belize, Benin, Bermuda, Bhutan, Bolivia, Bosnia-Herzegovina, Botswana, Bouvet Island, Brazil, Brunei, Bulgaria, Burkina Faso, Burundi, Cambodia, Cameroon, Canada, Cape Verde, Cayman Islands, Central African Republic, Chad, Christmas Island, Cocos (Keeling) Islands, Colombia, Comoros, Congo, Congo, Costa Rica, Croatia, Cuba, Cyprus, Czech Republic, Denmark, Djibouti, Dominica, Dominican Republic, Ecuador, Egypt, El Salvador, Equatorial Guinea, Eritrea, Estonia, Ethiopia, Falkland Islands, Faroe Islands, Fiji, Finland, France, French Guiana, Gabon, Gambia, Georgia, Germany, Ghana, Gibraltar, Greece, Greenland, Grenada, Guadeloupe (French), Guam (USA), Guatemala, Guinea, Guinea Bissau, Guyana, Haiti, Holy See, Honduras, Hong Kong, Hungary, Iceland, India, Indonesia, Iran, Iraq, Ireland, Israel, Italy, Ivory Coast (Cote D`Ivoire), Jamaica, Japan, Jordan, Kazakhstan, Kenya, Kiribati, Kuwait, Kyrgyzstan, Laos, Latvia, Lebanon, Lesotho, Liberia, Libya, Liechtenstein, Lithuania, Luxembourg, Macau, Macedonia, Madagascar, Malawi, Malaysia, Maldives, Mali, Malta, Marshall Islands, Martinique (French), Mauritania, Mauritius, Mayotte, Mexico, Micronesia, Moldova, Monaco, Mongolia, Montenegro, Montserrat, Morocco, Mozambique, Myanmar, Namibia, Nauru, Nepal, Netherlands, Netherlands Antilles, New Caledonia (French), New Zealand, Nicaragua, Niger, Nigeria, Niue, Norfolk Island, North Korea, Northern Mariana Islands, Norway, Oman, Pakistan, Palau, Panama, Papua New Guinea, Paraguay, Peru, Philippines, Pitcairn Island, Poland, Polynesia (French), Portugal, Puerto Rico, Qatar, Russia, Rwanda, Saint Helena, Saint Kitts and Nevis, Saint Lucia, Saint Pierre and Miquelon, Samoa, San Marino, Saudi Arabia, Senegal, Serbia, Seychelles, Singapore, Slovakia, Slovenia, Solomon Islands, Somalia, South Africa,Taiwan, Tajikistan, Tanzania, Thailand, Togo, Tonga, Tunisia, Turkey, Turkmenistan, Tuvalu, Taiwan, Turkey, Vanuatu, Venezuela, Vietnam, Yemen, Zambia & Zimbabwe. Silicone rubber insulated high voltage wire and cable offers excellent dielectric strength and flexibility. Operation over a wide temperature range and ease of silastic bonding are other outstanding characteristics of silicone rubber cable. The cable is susceptible to pin-hole breakdown and cannot tolerate some dielectric/coolant fluids. TurbinesSilicone rubber insulated high voltage wire and cable offers excellent dielectric strength and flexibility. Operation over a wide temperature range and ease of silastic bonding are other outstanding characteristics of silicone rubber cable. The cable is susceptible to pin-hole breakdown and cannot tolerate some dielectric/coolant fluids. We are one of the major manufacturers and exporters of quality array of High Voltage Rubber Cables. Using premier quality raw material we carefully manufacture these products under the supervision of professional experts. We have a team of proficient laborers who manufacture these cables. We offer these cable are reasonable price range. We deliver quality product to our customers. These HT Rubber Cables are very much efficient tool to be used in industrial and mechanical purposes. We are one of the very well known companies which have made a remarkable name and fame in the industry with its past several years of satisfactory service to its clients. These HT (High Temperature) rubber cables which we are providing our clients are also one of the supreme and highly demanded products of our company. These HT rubber cables are made up of supreme quality rubber materials which are very tough and strong as well as very much resistive towards the temperature. Everything that you can think of works with wires. Including Motor vehicles. Wires work like nerves, untiring, relentless, and providing. Motors, Windmills, LTmotors, Oven, HT motors, wires are everywhere, working like the nerves of your house. It is with this understanding and inspiration that Bhuwal Cables Limited has always made the latest advances in wire design and engineering. Bhuwal Cables Limited have outstanding performance characteristics and represent contemporary design. Though designed solely with application and function in mind, our products are nevertheless endowed with a subtle aesthetic. We at Bhuwal Cables Limited think wires are not just objects; we believe that wires play the role of nerves in the body. Spread across your premises, empowering appliances, and reaching out to every corner of your house to make it come alive with energy. When you believe this you have designers, engineers, fabricators, and other partners who need to have incredible design and commitment to pursue and create a product that can be trusted, and relied upon. Our wires come with different characteristics to suit Motor companies, Transformers, Meters, Nuclear industries, Etc, and other projects. Take a look at our product profile and please ask for assistance or specific queries. We introduce ourselves as one of the noted manufacturer, trader, exporter and supplier of 600v Wire. The best quality of raw material in a perfect ratio is used to manufacture our offered cables. These cables are precisely tested for tested conductivity, tensile strength by our dexterous professional which helped us to come up with such distinct range. 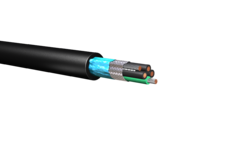 These cables are available in full range of sizes and shapes at industry-leading prices.